Dublin underwent an intense building boom during the ten years or so until early 2008. Under Ireland’s neoliberal economic policies, the emphasis was (and continues to be) very strongly on private enterprise as the key force in transforming the built environment. Government, local and national, was dominated by parties that believe in small government and a minimum of interference in the delicate balance of the market. This meant that there was virtually no social content in most of what was built in that period – no transport infrastructure, no educational insfrastructure, no energy efficiency, no green spaces, inadequate living space, insufficient drainage, poor materials and poor aesthetics. 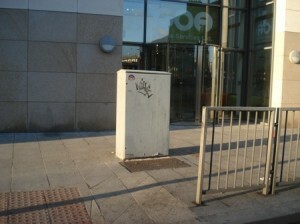 This box on Cork Street, which presumably contains a local telecommunications switch, is a product of its times. 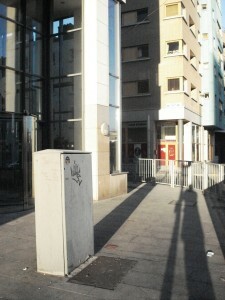 It once stood flush with the line of the buildings on the street, but the new structure behind it has a recessed entrance with a broad swathe of pavement in front of it. I suppose the broad pavement was designed with a view to creating a dynamism to the entrance to the glass-fronted atrium. However, whether by design or by default or by mistake, the box and its contents were never shifted back to the new wall line. And so it stands, ruining the pavement-to-atrium effect (lame though it would have been) and creating a pointless blockage on the public way. The problem here is not just lazy design and planning, it is a result of a toothless local government and planning regime, run by people who, when they are not being witless in their monitoring of how this entirely rebuilt street functions, are spineless in their attitudes towards builders, developers and property investors. It is a box of neoliberalism.